As our readers know, Vator has started a series called: When they were young. It's a look back at the modest days of startups, how they evolved in their first few years, and what traction they had at the time. In the end, we hope to have a good glimpse into what great startups looked like in their first three years. Stories like these are always well received, because it reminds us that anyone, regardless of pedigree and environment, can rise above the noise and have great influence. They show us the value of being resilient, persistent and committed. If we can follow their footsteps, maybe we too can have similar success. 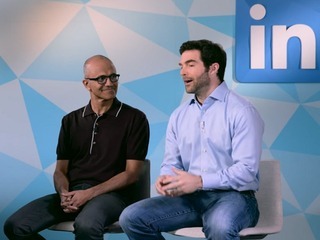 Today's segment is on LinkedIn, which was bought by Microsoft for $26.2 billion in June 2016. 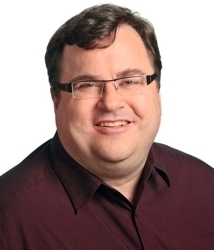 Founders (age at the time): LinkedIn is started by Reid Hoffman (35); Allen Blue (? ); Konstantin Guericke, (35); Eric Ly, (? ); and Jean-Luc Vaillant (?). 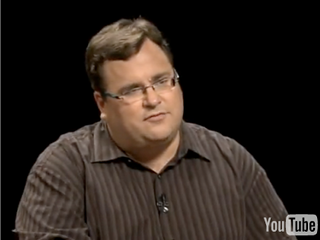 Blue and Vaillant had previously worked at SocialNet.com, a company that Hoffman had founded in 1997. While Hoffman becomes CEO, Blue is named Vice President of Product Management, Guericke becomes VP of marketing, Ly is its first CTO and Vaillant becomes VP of Engineering. 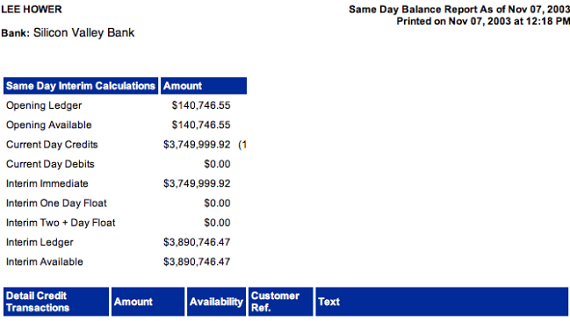 Initial company description: "Socialnet, I learned all kinds of things. Among them is to build products that are inherently unique to the net. Part of the thing is that the Internet has all these people, and they can all communicate with each other, but how do you get a good product out of that? So, we built it as a personal network product, where you invite your network on, and then you interact with your network as a way of solving real world problems," Hoffman told Vator founder Bambi Francisco in an interview in 2009. "That, 'My real identity is there, and I interact with people I have real relationships with,' is the thing that creates a platform for all kinds of interesting applications, and that platform for all these interesting applications was one of the ideas that I came out of reflecting, 'What should I have done better when I had done Socialnet?'" 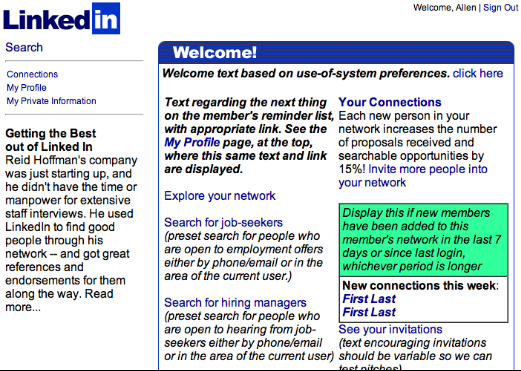 Product, at six months: On May 5, 2003, the LinkedIn co-founders send out their first 350 invitations, officially launching LinkedIn. 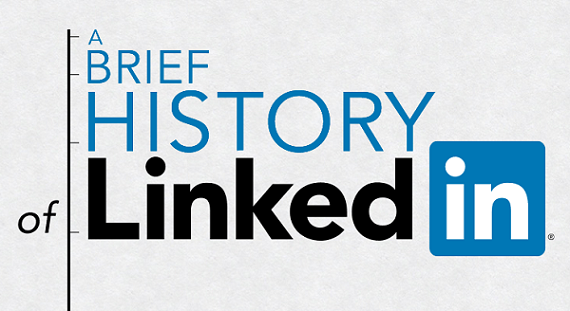 One week after launch, LinkedIn has 2,708 members and 4,500 by the end of the month. 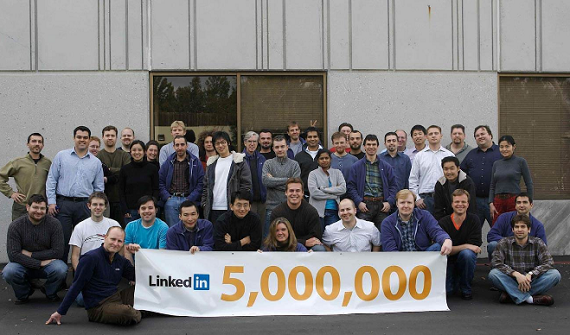 Traction, at 11 months from being founded, five months after launch: In October 2003, LinkedIn has 40,000 members. First funding, at 12 months: In November 2003, LinkedIn raises $4.7 million from Sequoia Capital at a pre-money valuation of between $10 million and $15 million. The company "spoke with at least 25 firms of various types," Lee Hower, member of the LinkedIn founding team, wrote after its IPO in 2011. "It was an interesting mix of reactions. A couple quickly grasped the opportunity we were pursuing and liked our team and concept," but most did not. One "was clearly very divided and a vocal minority of GPs thought consumer Internet companies were a massive waste of time and money," while In another, firm "pressure tested" Hoffman "to see if he still had entrepreneurial zeal, after already having some success at PayPal. That one didn’t end terribly well." The company "received term sheets from two firms and had a third which expressed interest in participating," but LinkedIn eventually went with Sequoia "for a variety of reasons." 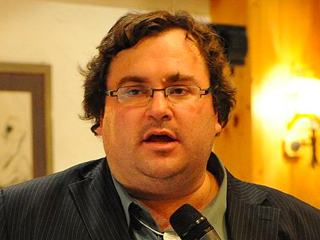 Traction, at one year from founded, seven months from launch: In December 2003, LinkedIn has 81,000 members. Traction, at one year and 11 months from founding, one year and five months from launch: In October 2004, LinkedIn has 1.2 million users, 370,000 of which are users in Europe and 70,000 in Asia. Second funding, at one year and 11 months: In October 2004, LinkedIn raises its second funding round, a $10 million Series B, from Greylock Partners, where Hoffman is now a Partner, having joined the firm in 2009. Also investing were Sequia, as well as 14 angels, including Marc Andreessen, Joe Kraus, Josh Kopelman and Peter Thiel. Traction, at two years from founding, one year and seven months from launch: In December 2004, LinkedIn has 1.6 million members. Product, at two years and four months: In March 2005, LinkedIn Jobs is launched as the company's first premium service and revenue stream. "On LinkedIn Jobs, candidates not only find open positions that match their interests, but also get background information on the job poster that can help them tailor their cover letter. More importantly, job seekers can learn which of their existing professional contacts can introduce them to the hiring manager or recruiter — or to someone who knows these key contacts," the company explains. "Candidates who come referred by a company employee have a significantly higher chance of landing a job than those who apply via traditional Internet job boards." Product, at two years and nine months: In August 2005, the company introduces Business Accounts to appeal to recruiters and researchers. Traction, at three years after founding, two years and seven months from launch: In December 2005, LinkedIn has four million members. Revenue, at three years and four months: In March 2006, LinkedIn announces that it "expects to reach profitability this month," thanks to "the rapid adoption" of its premium accounts, which had been introduced only seven months earlier.